Blue Moon Zinc Corp. (TSX-V: MOON) (OTC: BMOOF) is pleased to announce the discovery of high-grade zinc-copper-rich massive sulphides with precious metal values at its 100%-owned Blue Moon VMS deposit in Mariposa County, California. Blue Moon’s 2018 drill program demonstrates that the massive sulphide lenses are now traceable for approximately 3,000 feet (900 metres) along plunge and remain open to surface and depth. The Blue Moon NI 43-101 Inferred mineral resource announced on November 20, 2018 had a zinc equivalent (“ZnEq”) of 8.07% at a ZnEq cut-off grade of 4.0%. (1) Zinc Equivalent calculation below. (2) True widths of the reported mineralized intervals are estimated to be 55% of the drilled width. (3) These are uncut assays. (4) The dip angle of hole BMZ-78 was -60 degrees and the average azimuth was approximately 257. The dip angle of hole BMZ-75 was -40 degrees and the average azimuth was approximately 260. A long section is attached to this news release. The drill program consisted of approximately 4,000 feet of HQ core drilling in 4 holes. BMZ-78 confirms the presence of thick and steeply plunging massive sulphide mineralization with in the Main Zone. Step-out hole BMZ-75 demonstrates that mineralization extends an additional 200 feet up plunge and north of historical workings showing the massive sulphide lenses are now traceable for approximately 3,000 feet along plunge and remain open to surface and depth. Hole BMZ-76 was drilled to a depth of 950 feet and was terminated due to a material deviation of the hole after exiting a fault and would not have reached the intended target zone. Hole BMZ-77 was drilled to a depth of 180 feet and was terminated due to poor drilling conditions and was re-drilled from the same platform and renamed BMZ-78. Drilling completed on the project in 2018 was supervised on-site by Peter A. Herrera, P. Geo, who collected and tracked samples and implemented a full QA/QC program using blanks, standards and duplicates to monitor analytical accuracy and precision. Drill core was logged and sampled in a secure core processing and storage facility located at the Blue Moon site in Mariposa County, California. Core samples from the program were cut in half using a diamond bladed rock saw, sealed onsite, and were delivered directly by Mr. Herrera to Bureau Veritas’s (BV) lab facility in Sparks, Nevada, for analysis. BV’s quality system complies with global certifications for Quality ISO9001:2008. Pulps from the higher-grade samples as well as the duplicate samples were analyzed by ALS laboratories in Reno. Core samples were analyzed using a combination of BV’s MA300 process for low level concentrations (ICP-ES 4 acid digestion) and the MA404 process for higher level concentrations of lead (ICP-ES 4 acid digestion). Gold assaying was completed with FA430, a 30-gram fire assay with ICP-AAS finish. Base metal over-limits were finalized with titration GC816 (zinc), GC820 (copper), and a silica wash was used between high-grade samples to ensure no sample carry-over. No material differences were found in any of the quality control samples nor were there any material differences between the results received from BV and those received from ALS. No QA/QC concerns were observed with the results shown in this report. ZnEq = (Zn%*24.70 + Cu%*55.80 + Pb%*19.00 + Ag(oz/t)*11.05 + Au(oz/t)*875.00) / 24.70. 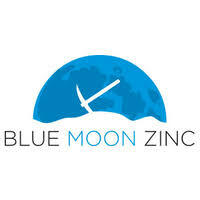 Blue Moon is currently advancing its 100%-controlled Blue Moon zinc deposit which also contains copper, gold and silver. The deposit is open at depth and along strike. The Blue Moon 43-101 Mineral Resource includes 7.8 million inferred tons at 8.07% zinc equivalent, which includes 771 million pounds of 4.95% zinc, 71 million pounds of 0.46% copper, 300,000 ounces of gold at 0.04 oz/t, and 10 million ounces of silver at 1.33 oz/t. The 43-101 was filed on www.sedar.com on November 20, 2018. The Company plans to advance the Blue Moon Project through to feasibility, permitting and ultimately production.